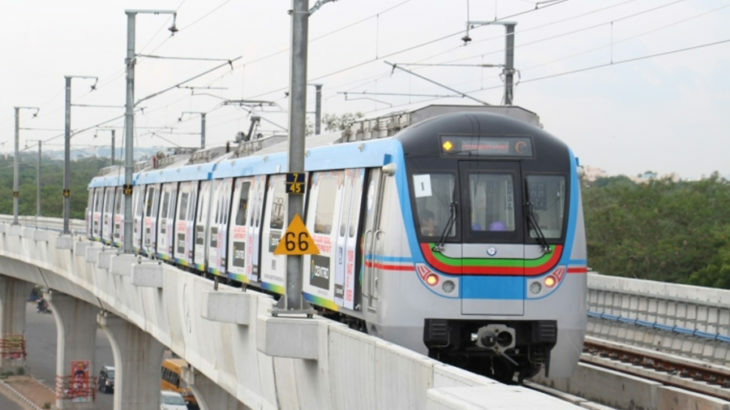 Hyderabad, Metro Rail News: City commuters who eagerly await the commercial operation of metro operations between Ameerpet and Hitec City will be soon after the Commissioner for Metro Rail Safety (CMRS) inspect the stretch. L&T Metro Rail Hyderabad Ltd, the concessionaire implementing the 72-km-long metro rail project in Hyderabad, is set to commission the much-awaited link to Hitec City. Trial runs have been under way for the past few weeks. The Chief Electrical Inspector for Hyderabad metro, DVS Raju, today conducted the statutory inspection of rolling stocks (train sets) in the metro depot. The train sets have been procured from Hyundai Rotem Company of South Korea. Following the inspection, “ This inspection will facilitate the commissioning of the stretch between Ameerpet and Hitec City line of the Corridor 3. We have checked all safety features of the rolling stock, including emergency evacuation process.” said DVS Raju. The commissioning of this line will enable L&T management to fully operate two lines of the three corridors it has taken up for development. Although, the third corridor, which connects Secunderabad with the Old City at Falaknuma will take some more time. While the main stretch up to the Central Bus Stand on the Musi river will be commissioned later this year, the line which terminates at Falaknuma is likely to take more time as there have been some right of way issues. This is being negotiated by the State. The commissioning of the link up to Hitec City is likely to ease the traffic congestion on the busy line up to the IT hub where lakhs of people commute for work daily. It is high time the METRO Rail Project is commissioned as early as possible. It is already delayed after I and our team designed the Electrical part of the project, with 6 Traction Substations and A/C Traction system and 33KV distribution net work of this project.This 73 kms. Metro line could have been better than many in our country and profitable with lot of benefits of ease of travel in the city. Hope for the best and good luck to HMRL.